If I were a GameStop employee right now I would be so very sick of midnight openings, unless of course I worked at the Universal CityWalk location in Los Angeles, where they'll be hosting the official “‘Gears of War 2’ Midnight Mayhem” event. 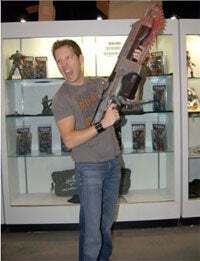 Dude "Cliff Bleszinski" Huge himself will be heading up an all-star lineup of talent from the game, including John Di Maggio, the voice of Marcus Fenix and Futurama's Bender. They'll even have folks in the Nightmare Armor Studios Delta Squad costume patrolling the streets, handing out Gears of War merchandise! Meanwhile, at the less important GameStops, they'll still have trivia challenges and tokens for exclusive in-game gold-plated Hammerburst weapons and Xbox LIVE themes. It's not Bender, but it's something I suppose. Call your local GameStop to find out if they're hosting midnight events, and reassure your wear game advisor that the season is almost over and they can rest soon.GameStop to Host Gears of War 2 Launch Events Nationwide GRAPEVINE, Texas—(BUSINESS WIRE)—GameStop (NYSE: GME), the world's largest video game and entertainment software retailer, today announced that it will host midnight release events for the Xbox 360 exclusive “Gears of War 2” by Epic Games at 3,500 stores nationwide. Starting at 9 p.m. on Thursday, November 6, 2008, customers can visit their local GameStop and be among the first to get their hands on the new game at 12:01 a.m. Fans will have the opportunity to compete in a variety of trivia challenges as well as have the chance to bring out their inner war hero during “Gears of War” tournaments. Customers who purchase “Gears of War 2” at the events will receive an Xbox LIVE token for an exclusive in-game downloadable gold-plated Hammerburst for use in multiplayer gameplay and “Gears of War 2” Xbox LIVE Theme tokens, while supplies last. These tokens will not be available beyond the night of launch. In addition, GameStop will host a marquee “‘Gears of War 2’ Midnight Mayhem” event in Los Angeles at its Universal CityWalk location with Xbox 360. The midnight extravaganza will feature special celebrity appearances and autograph signings by Cliff Bleszinski of Epic Games, the creative force behind the game, and “Gears of War 2” voice actors John Di Maggio (Marcus Fenix), Lester Speight (Augustus Cole), Carlos Ferro (Dominic Santiago) and others. Additionally, fans will have the unique opportunity to hang with a real life “Delta Squad” – costumed characters from Nightmare Armor Studios will be patrolling the GameStop event handing out free “Gears of War” merchandise throughout the evening. In “Gears of War 2,” players continue the story of Marcus Fenix, a reluctant war hero, as he leads Delta Squad on a series of perilous and adrenaline-pumping missions. “Gears of War 2” blends a best-in-class third-person shooter with unsurpassed high-definition visuals, all layered on top of an engaging story of survival, loss and retribution. To participate, visit a GameStop store for details. To find a local store, log on to GameStop.com, and search using the ‘Store Locator.’ For more information about “Gears of War 2,” please visit www.gearsofwar.com.